What is this? A bar, a pub?? They themselves call it a music bar, in fact the board outside says World Music Bar. So what does it mean? Well it's actually a cozy bar that plays background music and on every Monday evening, there is a live musical performance. So how is it different from any other bar? There is actually no technical difference except that it comes with just another different ambience with an appeal which has made it quite popular with the locals, merchants, expats and even returning tourists. This is a place where you can meet many merchants & tourists over a drink, have casual chats with them and become instant friends. The casual friendly atmosphere of the bar actually promotes friendly interactions. But why such a weird name Budaba? This is what I could decipher having been to the bar a few times. The owner seems to be great believer in the Hindu deity the Lord Buddha. There are couple of statues of Lord Buddha on two sides of the entrance door. So combination of the words Buddha and Bar would have given rise to such a name. Well who cares? Inside there is no god or goddess in play, that's for sure. It's a standalone cottage house and is part of the Green Village hotel located right next to it. 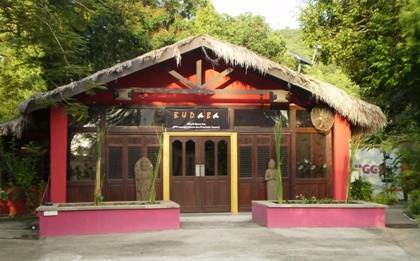 Budaba opened in December 2011. Inside the lights are quite dimmed. After you enter, you will need some time to settle your eyes, but once settled, you are at ease. While there are tall bar stools around the bar counter, there are also living room sofa type couches for you to relax and have a drink. Take a look at the interior... Dark bright red walls, celebrity photos on the wall and strange wall hangings and multicolored lamp shades give it a unique but a nice overall look. There is no happy hours here, but drinks are relatively cheap. A small bottle of beer is RM4 and a standard cocktail is RM7. Most evenings there is a background music playing reggae, blue etc, but the sound level is maintained at a comfortable decibel level so that your head doesn't start spinning after hearing a couple of numbers. On Monday evenings, there is a local band The Miracles that perform live in the bar. So Monday evenings are generally more crowded. People dance away to the wee hours. There is a 52" LCD TV and video projection on the wall that usually play MTV and some sports channel. So it also adds up as a sports bar. They don't prepare any food inside. However there is a menu card to order food. They will get it from the next door restaurant. Sanjay Naidu, the manager of the bar and the staffs are quite friendly and would immediately get into conversation with you should you so like. You can walk in. No reservation is required. You are required to pay only by cash. The Green Village Resort guests get a 20% discount on the bill amount. Jalan Pantai Tengah, Teluk Baru, Langkawi (It's on a side road from the main road).